It's a tension many modern parents feel daily when it comes to their children's playtime: how to balance screenless, imaginative, physical play with the irresistible draw and addictive sensory thrill of screen time. Fisher-Price, though, believes the two will soon merge. The Mattel brand, which caters mostly to infants and toddlers, has released a concept video—created with innovation design consultancy Continuum—showing what children's toys might look like a decade from now. In short, the physical and digital will merge to create delightful environmental experiences that leverage technology while retaining the core physicality of imaginative play. As Fisher-Price puts it, the "future products and experiences [are] rooted in solutions, play, learning, and development. The resulting video depicts a technology-layered day-to-day family experience that showcases a preserved human connection." The video, titled "The Future of Parenting," is, as its name implies, aimed at future parents—in other words, millennials and Generation Z. Those generations are digitally native, yet wary of prioritizing tech experiences over physical ones. 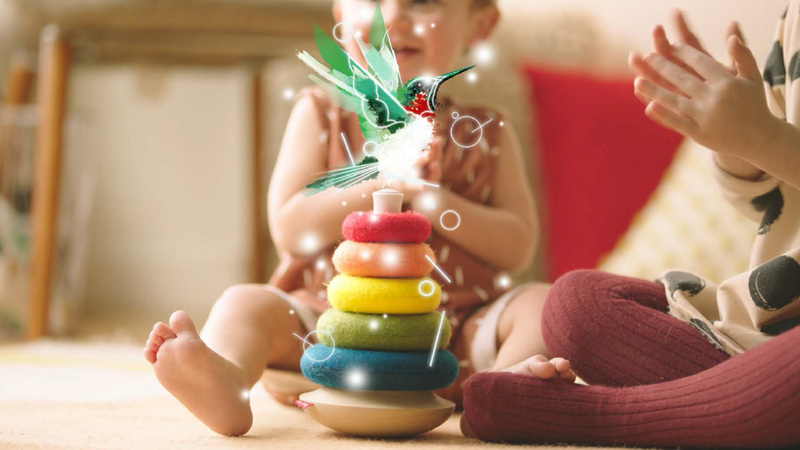 Thus, they should be drawn to these kinds of baby products, which use virtual tech like holograms but also physical elements like smart fabrics to find a balance between the two worlds. "Our research process led us to the conclusion that the future is not screen-based. When anything can be a display, tech will dissolve into the environment," Mark Zeller, head of design at Fisher-Price, tells Fast Company. "Thinking beyond the limitations of a screen means we'll be able to create toys and everyday objects that will have the power to catalyze parent-child interactions, contextualize learning moments, and spark open-ended play." This is a natural conclusion for a non-screen company to reach, of course, but it's also not an uncommon one. Everything from Microsoft's HoloLens to the famous video game scene from Spike Jonze's movie Her imagines just such a blending of physical and virtual, largely through holograms (as in the Fisher-Price video). Zeller said Fisher-Price used futurecasting to look 10 years ahead, but some of the innovations could be commercially available sooner. "We have started prototyping actual tech-enabled products that will inspire multi-year innovation in our line that may be available to parents as soon as 2017," he says. Fisher-Price and Continuum also released a white paper offering further explanation of the futuristic concepts and the insights behind them. Check that out at FutureofParenting.com.